The Institute of Nuclear Physics includes a branch in Western Kazakhstan Oblast, the Azgir Radioecology Expedition in Atyrau Oblast, and the Kurchatov Laboratory at the former Semipalatinsk Test Site. MPC&A: The Institute of Nuclear Physics participates in the US Department of Energy MPC&A Program. Material accounting systems installed in collaboration with US experts include electronic scales, a gamma spectroscopy system, computer equipment, and Automated Inventory Accounting System (AIMAS) software, which was customized to match the facility operations. Physical protection upgrades, including metal and nuclear material detectors, hardened portals and access points, and alarm and communications systems, were also implemented. According to the US Department of Energy, MPC&A upgrades at Alatau were completed in October 1998. In the spring of 1999, the DOE transferred responsibilities for long-term support of MPC&A responsibilities at the VVR-K reactor in Alatau to the International Safeguards Office. "Institut yadernoy fiziki," undated brochure received by CNS in June 2001. Kenley Butler, "Almaty, Astana, Alatau," NISNP Trip Report, June 2001, KAZ010600, pp. 6-12. Boris Kuznetsov et al., "Implementation of Material Control and Accounting at the Nuclear Facilities in Kazakhstan," Partnership for Nuclear Security: United States/Former Soviet Union Program of Cooperation on Nuclear Material Protection, Control, and Accounting (Washington, DC: Department of Energy, September 1998), pp. 1-2. "Research Reactors," The Nuclear Review, April 1996, pp. 5, 17. NISNP Correspondence with Kazakhstani government official, 12 May 1997. NNC official, "Activities of the National Nuclear Center of Kazakhstan," Presentation at CNS Seminar for Journalists, Almaty, Kazakhstan, 8-9 June 2001. NNC official, "Activities of the National Nuclear Center of Kazakhstan," Presentation at CNS Seminar for Journalists, 8-9 June 2001. CNS Interview with Institute of Nuclear Physics Official, 29 August 2001, KAZ010829. "U.S. Department of Energy and NTI Announce Key Nonproliferation Project with Kazakhstan," DOE press release, 29 September 2006, www.energy.gov. Jon Fox, "Kazakhstan Signs on to Downblending Program," Global Security Newswire, 6 October 2006. Emily Ewell, "Trip Report: Uzbekistan, Kazakhstan, Ukraine," May 1996. Kenley Butler, NISNP Trip Report, "Almaty, Astana, Alatau," June 2001, KAZ010600, pp. 6-12. NISNP Interview with NNC official, 18 July 2000, KAZ000718. "Nuclear Research Reactors in The World," Reference Data Series No. 3, 5/91, IAEA: Vienna, 1991, p. 43. "Agenstvo po atomnoy energii Kazakhsatana razreshilo pusk issledovatelskogo yadernogo reaktora v 30 km ot Almaty," Panorama, 5 December 1997, p. 10. Emily Ewell, "Trip Report - Uzbekistan, Kazakhstan, and Ukraine," 21 June 1995, p. 18. "Invitation for Cooperation," undated National Nuclear Center marketing brochure. On 11 February 2003, the Kazakhstani government announced plans to build an information technology park in Alatau. The new park, which will feature an industrial laboratory, office building, and modern computer and telephone networks, will be given tax breaks and customs privileges. According to Kazakhstani Minister of Energy and Mineral Resources Vladimir Shkolnik, Alatau was chosen because of its potential to attract capital and new technologies. Alatau has a large scientific community and is located near the former Kazakhstani capital, Almaty, which has numerous scientific and design institutes. Interfax, 11 February 2003; in "Kazakhstan to set up first technopark near former capital," FBIS Document CEP20030212000184. Boris Kuzmenko, "Silikonovaya dolina v Alatau," Parlamentskaya gazeta, 20 March 2003, p. 7; in Integrum Techno, www.integrum.ru. "Rossiya i Kazakhstan planiruyut sozdat termoyadernyy issledovatelskiy kompleks 'Tokamak',"RIA Novosti, 20 January 2003; Integrum Techno, www.integrum.ru. "Rossiya i Kazakhstan zaplanirovali vvesti v ekspluatatsiyu do kontsa 2006 goda termoyadernyy kompleks Tokamak," Finmarket novosti, 17 January 2003; Integrum Techno, www.integrum.ru. 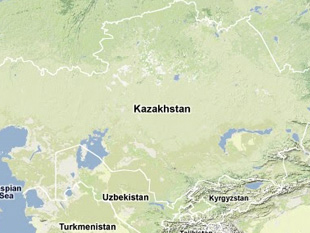 "Kazakhstan nameren postroit termoyadernyy kompleks 'Tokamak' na Semipalatinskom poligone," ITAR TASS, 21 January 2003; Integrum Techno, www.integrum.ru. Anne Marie Pecha, "DOE lab signs pact with Kazakh nuke scientists to aid U.S. medicine," Global Security Newswire; in Government Executive Magazine online edition, 24 September 2002, www.govexec.com. Asel Tulegenova, "Radioaktivnyy biznes," Ekspress K online addition, No. 176 (15089), 18 September 2002, www.express-k.kz..
 "V Kazakhstane proydet soveshchaniye uchenykh-atomshchikov," Interfax, 6 May 2001, www.interfax.ru. E.A. Azizov et al., "KTM project (Kazakhstan Tokamak for Material Testing)," International Atomic Energy Agency, www.iaea.or.at. "Nuclear Fusion Power," World Nuclear Association, September 2001, www.world-nuclear.org. "V Kazakhstane budet sozdan yadernyy reaktor," KazAAG, 10 May 2001; Integrum Techno, www.integrum.ru. The Kazakhstani National Nuclear Center (NNC) has begun to produce personal computers at the Institute of Nuclear Physics facility in Alatau. A quarter of the electronic components for these computers is produced in Kurchatov, where the US government provided almost $4 million to set up a joint venture, called KK Interconnect, between the NNC and the US-based KRAS Corporation under the CTR Industrial Partnerships program and the Defense Enterprise Fund. Express-K, 13 December 2000; in "Kazakh former nuclear town starts to make computers," FBIS Document CEP20001213000109. Said Uspanov, "'Mirnyy atom," Delovaya nedelya, No. 39, 8 October 1999, p. 9. Bakhytzhan Zhumaliyeva, "Yadernyy reaktor v 17 km ot Almaty. Yest osnovaniya dlya opaseniy,"Vremya Po, No. 83, 27 October 1999, p. 1. On 23 June 1999 the Institute of Nuclear Physics discovered that a 2MT tank used to transport liquid radioactive waste was missing. On 24 June Khabar television reported that the tank had been found on Institute territory. However, on 30 June Interfax-Kazakhstan reported that the tank was found on the grounds of the Kauser (Kausat) distillery (or winery) near Almaty. Distillery management had acquired the tank from a private individual two months previously. According to some estimates, background radiation around the tank's surface exceeded permissible levels by a factor of 20. (For more information on this case, please see the 24 June 1999 entry in the NIS Nuclear Trafficking Database. Khabar television, 23 June 1999; "Video Selection List: CAU 99-026," FBIS Document FTS19990709000270. Interfax-Kazakhstan, 30 June 1999; BBC Summary of World Broadcasts, 30 June 1999; in "Kazakhstan Nuclear Institute's Lost Tank Turns Up at Distillery," Lexis-Nexis Academic Universe, www.web.lexis-nexis.com. Khabar television, 24 June 1999; "Video Selection List: CAU 99-027," FBIS Document FTS19990707000330. While discussing conversion of the Institute of Atomic Energy's VVR-K research reactor, the authors of a presentation at the 2nd International Conference on Non-Proliferation Problems held from 14-17 September 1998 noted the need to alleviate budgetary problems and to bolster government support for the project. The government of Japan financed ISTC project K-012, which allowed the reactor to restart after a nine-year shutdown. A number of joint research projects were proposed to support the facility, including a study of reactor safety in seismic areas, design of dry storage vaults for spent fuel in seismic areas, development of procedures for disposal of highly radioactive waste in seismic areas, and development of a continuous seismic monitoring system for the VVR-K reactor. Researchers have attempted to manufacture medical isotopes at the facility but need additional funds for technical changes necessary to do so. Zh. Zhotabayev, "Conversion at the Research Reactor WWR-K." Paper presented at the 2nd International Conference on Non-Proliferation Problems, Kurchatov, Kazakhstan, 14-17 September 1998. The government of Japan has donated scientific and medical research equipment worth $1 million to the Institute of Nuclear Physics as part of a collaboration on denuclearization the two countries initiated in March 1994. The donation included electron spin resonance (ESR) equipment and instruments for measuring radiation in soil and in animals' teeth. At a ceremony to mark the official transfer of equipment held in Almaty on 25 February 1998, Sergey Pivovarov, manager of the Institute's magnetic resonance laboratory, said that the equipment would be useful for studying the full effects of nuclear testing in Kazakhstan. Oleg Khye, "Pravitelstvo Yaponii peredalo kazakhstanskomu Institutu yadernoi fiziki oborudovaniye dlya radioekologicheskikh issledovaniy," Panorama, 28 February 1998. "Experimental reactor Brought up to 'Energy-Producing Level'," Rossiyskaya gazeta, 17 January, 1998, p. 1; in FBIS-SOV-98-021, 21 January 1998. "Agenstvo po atomnoy energii Kazakhsatana razreshilo pusk issledovatelskogo yadernogo reaktora v 30 km ot Moskvy," Panorama, 5 December 1997, p. 10. The United States Department of Energy (DOE) has provided nondestructive assay techniques and systems to upgrade material protection, control, and accounting (MPC&A) at the Institute of Atomic Energy facilities at Kurchatov and Alatau. MPC&A equipment has been delivered to Kurchatov and Alatau, and activities at these facilities are essentially complete. However, the United States still needs to provide on-site training for gamma spectroscopy systems at these two sites, and some follow-up is predicted as the sites adjust to new equipment and procedures. The sites require calibration materials, which will be provided by New Brunswick Laboratory after Kazakhstani regulatory approval. J.K. Sprinkle et al., "Application of Nondestructive Assay Techniques in Kazakhstan," paper presented at the Institute of Nuclear Materials Management 38th Annual Meeting, Phoenix, Arizona, 20-24 July 1997.